“It’s not coming out! I’ve been rubbing for ages!” hollers Dave from the shower. “You’ve got to rub pretty hard, but it will come out eventually”, Olly laughs reassuringly. Dave enters the room, at first glance he appears to be clean, as one would expect having just come out of the shower, however upon closer inspection the colour of his face resembles that of a beetroot salad. 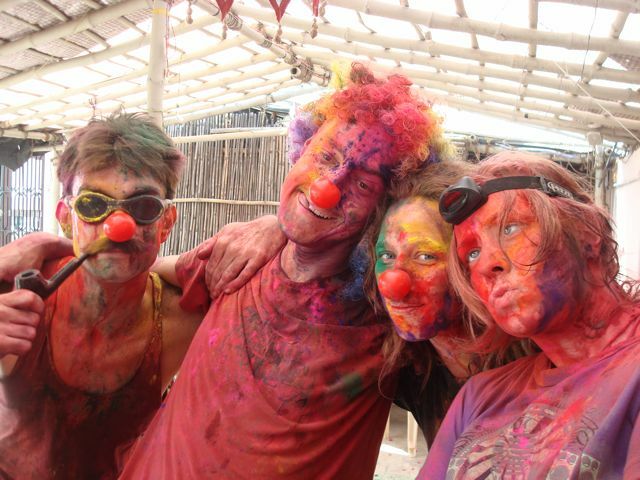 This is due to the fact that the team have been prematurely celebrating the festival of colour and attacking one another with brightly coloured dyes (some of which seem to be more permanent than others), on the rooftop of the guest house. Ordinarily there is very little that will get the whole team up and exerting that amount of energy so early in the morning, but the prospect of being on National television appeals to the majority of the team. 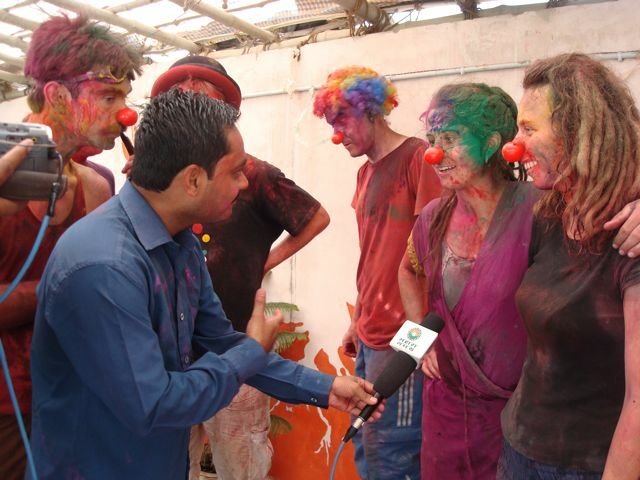 After their previous night’s performance on the banks of the river Ganges, the exhausted team members were informed by Kailash, the guest house owner, that television reporters would be round first thing in the morning to film them all engaging in ‘colour play’. 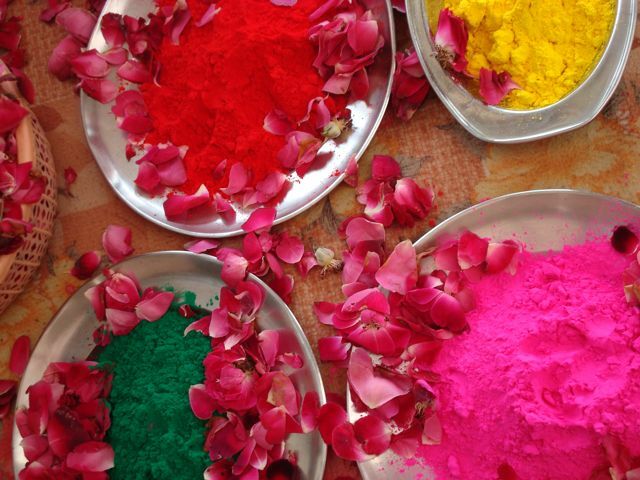 Holi represents yet another curiosity of Indian culture, a time of year to celebrate merriment by throwing powdered dye into peoples faces, ensuring the efficiency of the dye is maximised by then having a water fight; the end result being a multi coloured pigmentation to the skin, which becomes semi-permanent. The attempt to dissuade women from getting involved in the fun during the morning of Holi proves to be ineffective and some of the team have decided to brave it, armed with multi coloured powders, water pistols and much courage. Valiantly, a small gang leave the guest house, returning after some time covered form head to toe in multi coloured camouflage and most of their dignity seemingly intact. Those of us who have chosen to keep clean on this morning of craziness tentatively step out onto the balcony of the guest house to witness the battle field on the street below, knowing that an attack could come from any angle. By noon, the craziness seems to have subsided and apart from the odd solo, multicoloured straggler, all that remains are bright puddles and vibrant stains which now decorate the street. The prospect of safely walking the streets without getting attacked begins to lure the less brave of us and we cautiously wander into the desolate town in search of a meal (hopefully free of any colourants). Two days ago we did our first show in Varanasi at Asha Deep Vidayashram (www.asha-deep.com) which translates loosely as Lamp of Hope School. The school is attended by kids of parents on very low incomes, Rickshaw Walhallas, Chai Walhallas etc, they pay a nominal fee to show willing for their child’s education. The school started in February 2004 and recently moved to a new location in a grand old building with a great view at the back of the river Ganges. PWB have been coming here on every project, so we have great expectations. The show itself was very well received, perhaps because they have seen shows in the past or maybe the culture here…but it was fantastic to get applause for individual tricks which hasn’t really happened in the previous shows, with the effect that you end up thinking that the crowd isn’t enjoying themselves until the response at the end of the show. A lot of clowning in this show with a few of the PWB crew being under the weather. Lots of drops and missed timings but due to this an increase in improv and general silliness, nearly setting an electrical wire on fire and actually setting Mike on fire! (by his own doing). Yesterday was the first day of teaching at the school, some members of the team had hired bikes for the short ride from Ganga Guest House to the school. 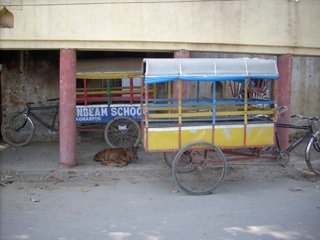 The rest of us took a school bus rickshaw (You have to see them to believe them! GREAT!) with the kit. 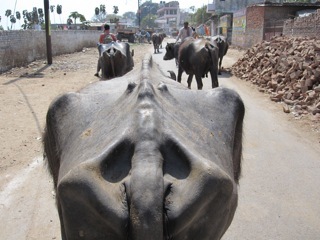 Unfortunately we hit gridlock India style and a cow, apparently a lorry had fallen into a hole. The roads in Varanasi are old, windy and all being re-done, very different from Viayawada. So our Rickshaw takes the back route. I feel a bit guilty sitting there as this guy pushes us over the rough terrain and jump out and help push all the way to the school. The upshot of this is that we arrive a little late. The kids are eager and ready to go so we begin. Using skills learnt from Viayawada and having the confidence to know that whatever you do the kids will appreciate you just being there and having fun! Its great to work with both boys and girls however I must admit its mainly the boys who interact with me. There were a lot of kids and we did an open box idea with all the props as a re-introduction to circus. Very impressive skills were shown with a couple of the boys unicycling confidently! The contact time with these children will be much higher than at SKCV so we have high prospects and finish the session on a real high. So a whole new project begins. There were times today when I thought back to the other boys and girls we have left behind in SKCV, now more names to learn, more characters but I know I will never forget my time and experiences with those kids…only add onto them here in Varanasi. Indecipherable signs, Tuc-Tuc’s, film posters, cycling on the wrong side of the road, man peeing, film posters, Tuc-Tuc’s, motorbike, side-saddle, Coca-Cola, IBP Indian Oil, Xerox, Brooms and Ropes, Tuc-Tuc´s, film posters, Sri Krishna Timber depot with baby Krishna, Coconuts, Old cycle rickshaw wallah, Pepsi with Cricket star, film posters, Tuc-Tuc’s, Political Party flags and poles, Tyres, Tea, Tiffen and Temples…….and of course…..
BBBBBEEEEEEPPPPPP BEEP Beeeeeppppp BBEEEEEPPPP BEEEEEEEPPPP. During our first month in Vijayawada we had ample time to perform our new show. The first 3 shows were with SKCV where our teaching projects were spread over 3 locations: The drop-in center (a night shelter for street boys) and the boy´s and girl´s villages (a home environment for those ex-street kids without any family support). After our enthusiastic reception on Kudlee beach, Gokarna, the team entered these new shows with bundles of new energy, and this certainly paid off. The kids responded with high energy clapping, squealing and laughter throughout the shows, laying a good foundation for our workshops to begin. With many different stages of varying sizes and obstacles, the PWB team managed each show with true professionalism. The drop-in center provided the first show for the team and this went off without too many hitches, and managed to pull a few random kids from outside the center, into the audience. The show went down really well despite a slow start in audience participation, by the end we had a couple of standing ovations for the fire. We were then invited to eat with the boys, they were full of smiles, appreciation and couldn’t wait for the workshops to start. At the boys village the team were treated to a green room with fan and leather sofas! The constant topping up of snacks and chai meant the show began with great energy on a rather large caffeine high, despite a few performers still recovering from the long train journey and their first round of delhi belly! The girls village was the show that provided a little more time for some pre-show clowning. This involved some nifty hat tricks from Andy and Mike, followed by balloon modeling and general comedic interference from the rest of the crew. I think the staff members also enjoyed being singled out in some clowning from Dave. The girls also provided a copycat for Olly during the show, providing lots of audience participation and a slight challenge for the authoritarian figure of Police. All shows were left with a buzzing audience and much enthusiasm for the upcoming workshops. Whilst in Vijayawada we were also invited to perform extra shows for a larger organisation called Care and Share. We were given a tour of their bakery, nursery, school and extensive grounds. Our show was incorporated into a show the kids were performing for some of the initial sponsors. It involved traditional indian welcome dances followed by other acts such as group songs oriented around community and hope, built up a nice crowd for the PWB main act. Issues with the provided soundsystem, after hours of adjusting to make Celine Dion as loud as possible for pre-show entertainment, made an interesting new challenge for all performers as there was no melody to take our cues from! We quickly changed back the the good old PWB amp, and the show continued. Mike and Jemma seamlessly presented a beautiful two-high with fire staffs for the first time on tour, receiving a huge applause from the audience. With ample space the fire skipping rope was perhaps the safest we had done it, apart from the slippery paraffin soaked floor on which we were jumping… A panting and exhilarated PWB crew then sat to watch the end of the children´s presentations. Much to the delight of the team, the next song was a Micheal Jackson tune- Heal the world. A much enjoyed karaoke session! The team were treated to a meal with parmesan and beer after which we bundled into the Care and Share bus, most of the team were asleep within 10 minutes as we made our way home. Halfway through the month the team were asked to perform at the local school where we were living in Gollapudi. This gave the team a great chance to give back to the local community and bring smiles to another 1,500 kids, parents and teachers. Apart from initial confusion from the soundsystem the show went smoothly, with extra space to play with and 2 levels to arrange the fire show there was definitely more space for creative improvisation. The audience, although restless, increased in size as the performance continued. At the end team members had to rush forwards to protect the flaming lighting bowls at the front of the stage as excited children rushed forward to shake hands and ask for autographs. Each member of the team was bombarded by many kids and staff in the dark, making clearing the stage a little bit of a challenge. We were treated to a traditional Andhra Pradesh dinner (renowned for its spice), where Livi learned the hard way how to distinguish chilies from peppers. Our Final show was performed at Care and Share´s home for children affected by HIV / Aids. We began with a short workshop in the midday heat, we were surprised at how quickly the skills were being picked up and the attention and enthusiasm shown by the kids. This could have been due to a english medium at Care and Share or the children´s prior experience of interaction with Italian clowns who also had volunteered at the center before. This made the performance more intimate, with a real sense of the crowds emotion throughout the show. However, this show had many challenges. Being down one member of the team meant a quick run through of changed audio cues and re-write of the club stealing routine before the show. Eluned and Livi loved showing off their improved level of juggling skills since writing the show in Gokarna and pulled of a pretty seamless routine stealing clubs from a rather confused clown (Dave). The audio set up seemed at first sight to be better than the previous show; all parts of the soundtrack were audible and only a couple of wires to deal with at the sound desk. Partway through the show, many members discovered their use as a grounding rod for the dodgy electronics and that bare feet was not an option for operating the sound cues. The show that the PWB team has created feels like an unfinished story, every time it is performed the space for improvisation grows. As the crew live and train together, not only does the performance itself get tighter but new ideas are also invented to fit the new level of skill being developed whilst in india. The journey has not finished yet and during the Varanesi project we hope to fill it to the brim with excitement and joy, both for performers and audience. It is our first day of teaching on tour. When we arrive, chatty children and random chickens greet us as we pile out of our tuc-tucs and carry our circus kit to the yard where we will be teaching. We are at the boys´ drop-in centre in Vijayawada, one of three projects for street children and orphans where we will be working throughout the month, all run by the local charity SKCV. The two other centres, a boys’ home and a girls’ home in rural settings on the outskirts of the city, have a somewhat more settled feel and we tend to see the same children week after week. By contrast, at the drop in centre there are often new faces at our workshops, new names to learn and new characters to get to know. It is always buzzing with an energy which is usually playful, often chaotic and occasionally verging on explosive. It is by far the most challenging centre, but in many ways it can also be the most rewarding, especially because you get the sense that learning circus skills is a very rare break from pretty tough lives for many of the individuals who come here. At each centre, before we start teaching we enjoy a meal sitting with the young people. Some of us are scolded light-heartedly by the kids serving out food as we wriggle while we eat, trying to get used to sitting cross legged on the floor and using our fingers rather than knives and forks. After lunch we spend a bit of time chatting, playing thumb wars, learning the latest handshake or some new phrases in Telegu or listening to music with the kids. This is also a good chance to get to know people’s names – important not only for teaching, but also because every time we return, we are immediately tested by dozens of children demanding “my name, my name?”. 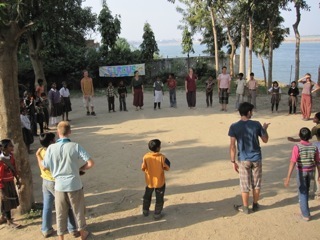 The workshops begin with games for the whole group. For the most part, we seem to be successful in conveying the rules without using too much English, but sometimes even our best efforts at miming an explanation result in confusion. That said, the end result seems to be the same, with plenty of running around, tumbling about and a lot of laughter. We then split into smaller groups to teach the circus props, which include juggling, hula hoop, diabolo, poi, flower sticks and plate spinning, as well as acrobatics and dance sessions. Juggling balls are thrown, and sometimes caught, bright plates on sticks form a vibrant rainbow, and yellow hula hoops shimmer in the sunlight as they spin. The kids really engage with the different skills, and whilst many of them start out as beginners with the circus props, they show real enthusiasm and perseverance as well as the creativity to come up with tricks we’ve never seen before. As we teach, we are constantly surrounded by excited shouts of “sister, sister” and “brother, brother” as everyone wants to show us how they’re doing with their prop. As the lead dance teacher I am hugely impressed by their dance skills, and am left open mouthed when a routine which took the PWB performers over half an hour to learn is mastered by the girls in just five minutes. Both the girls and the boys are keen dancers and after the first class I find myself really looking forward to teaching them again. On one occasion we are invited to watch the girls perform a mixture of classical Indian and “disco” dance to Tollywood (Telegu films) soundtracks. Pretty soon we are all on our feet learning from the girls and attempting to match their fast gestures and accurate movements, and I make a mental note to watch more Indian music videos for inspiration in future. As the weeks progress, the skill levels start to increase and pretty soon the juggling balls are being caught more often, the diabolos are flying in a more deliberate direction and the kids find more and more inventive ways to balance a plate/flower stick/hula hoop/each other. After the first couple of weeks we attempt to help the kids prepare for their shows, and they concentrate on practicing tricks with their favourite props. It is really moving to watch kids who just a couple of weeks ago were throwing down props in frustration balance a spinning plate for the first time, or cleanly juggle several throws in a row – in one particularly memorable case 35 throws! It is also a great learning curve for each of us. We came to the project with a diverse range of performance skills and teaching experience, and at each of the centres in Vijayawada we find a different group dynamic and set of challenges to work with. It is a chance to develop not only our own teaching styles but also to really learn to teach together as a team. Interacting with the kids has been at times difficult, and at times entertaining, but every day we taught at SKCV it was a mind opening and enlightening experience which we hope was as uplifting for the kids as it was for us. You are currently browsing the Performers Without Borders blog archives for March, 2011.